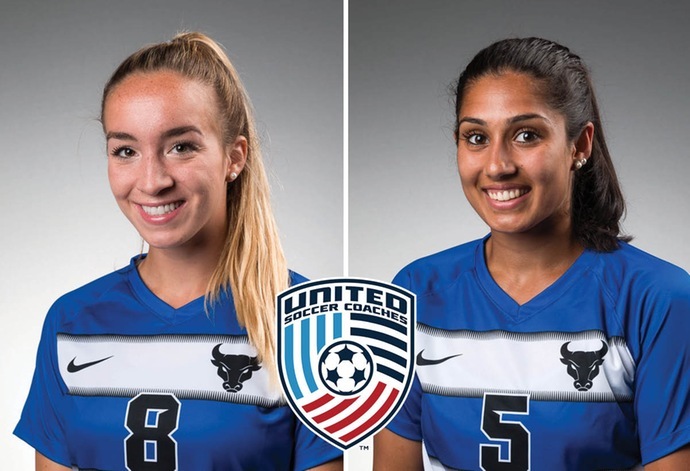 BUFFALO – University at Buffalo women's soccer standouts Carissima Cutrona and Gurjeena Jandu were named to the United Soccer Coaches NCAA Division I Women's All-Midwest Region Team on Tuesday. Both Cutrona and Jandu were named to the third team. Cutrona, a lethal forward whose season was cut short due to an injury, was having one of the best campaigns in a long time for a Buffalo player as she had eight goals and eight assists for 24 points in just 11 matches. The senior from Williamsville finished off her final season in fifth place in scoring while leading the conference in points per game (2.18). She netted at least one point in her final 10 matches of the season while setting a career-high with eight helpers. For her career, Cutrona ranks fifth in assists (18), sixth in goals (28) and sixth in points (74). Jandu, a junior defender had another strong season on the backline for the Bulls. The team captain was the catalyst for a strong UB defense as she helped the Bulls secure eight clean sheets on the season while holding opponents to 1.44 goals-against per game. Also a three-time All-MAC selection, Jandu has proven to be one of the best defenders in the conference. "This is great recognition of our two captains," head coach Shawn Burke said. "This group had to deal with so much adversity this fall and for these two to still be recognized nationally says a lot about them and their character." Click here for the entire USC All-Region Team.